Home » Galleries » Past Shows » 2008-2009 » Center for Faith and Life » "Spiritual Visions"
Robert Kennon is an associate professor of art and head of department at Culver-Stockton College, Canton, Missouri. He holds an MFA in printmaking and an MA in art history, both from the University of Iowa. 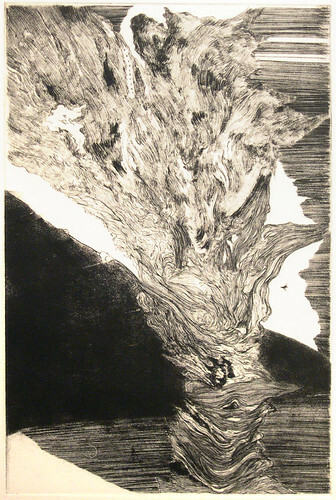 His work has been included in several dozen exhibits throughout the United States and abroad, and is held in numerous collections, including The Print Council of London (England) and the Boston Printmakers at Emmanuel College in Boston, PA, to many only two. 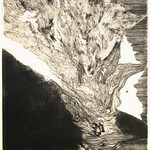 His exhibit at Luther contains 22 original engravings with mezzotint, and linoleum cuts. "My compositions are influenced by religious sources in 18th and 19th century Romantic art and theory. Inspired by Immanuel Kant's essay, The Critique of Theological and Aesthetic Judgement (1787), I have assimilated into my artwork a non-pantheistic interpretation of the sublime, in which the mind contains the abstract representation and divine inspiration of God. The 'sublime' is the name given to what is absolutely great, as in religion, through a manifestation of an all-powerful being or deity. The representation of God into a concrete form is the most challenging response which I can formulate. By interpreting the deity as a form of power, wisdom, justice or truth, I am led toward psychological and spiritual enlightenment. Therefore, I have chosen to represent God and other religious icons in abstract form through the attributes of infinity, vastness and astonishment. The main reason for creating my own interpretation of the Bible is that I believe contemporary society has abandoned religious art. Thus, I wish to evoke a radically different symbolic language not based on traditional theological interpretation, which will restore the importance of spirituality and faith to the viewer."